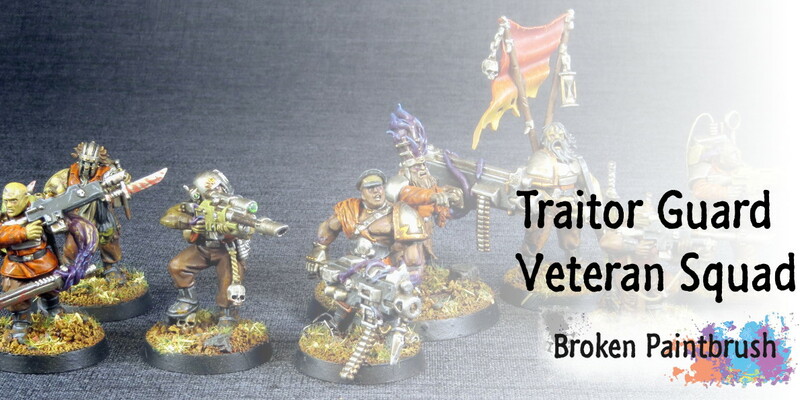 Next up in my picture re-take experience is my Traitor Guard Veteran Squad. I really wanted to make these guys stand out a bit from the standard traitors so I added a number of extra bits, conversions, and mutations to the group. The bits includes an array of parts from the Cadian and Catachan Imperial Guard kits, the ever wonderful Flagellant kit, and Chaos Marauders. I also used a good deal of Green Stuff to add mutations including a complete new arm to hold one of the Catachan blades. 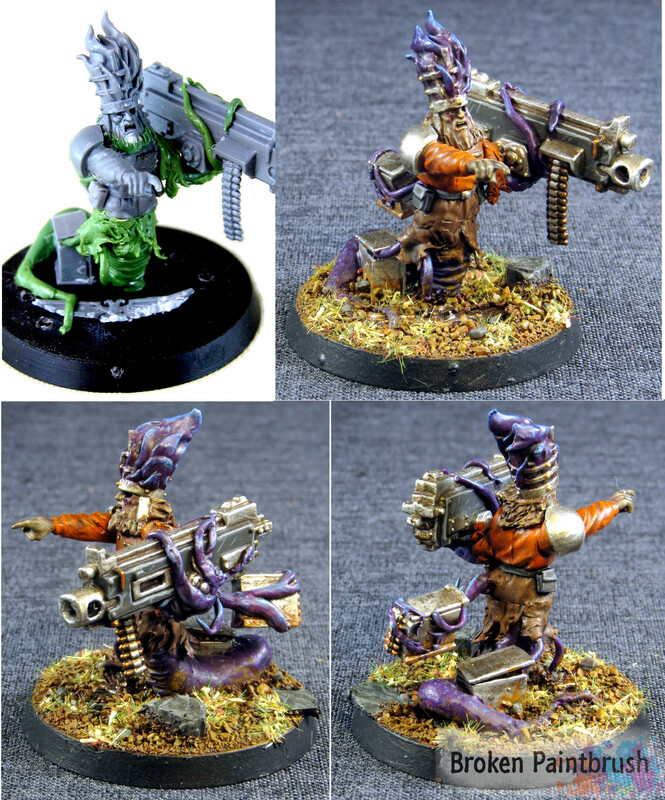 Some of the conversions were subtle, such as the extra tentacle on the first snipers trigger finger while others were a bit crazier, such as the eye-stalk head. Ever squad of note needs a fancy banner to guide them and encourage the troops. While not a real upgrade for veteran squads, it looks so darn cool I had to find a place for it somewhere. His sword army I actually think comes from the Zombie box, so now I’m up to 5 product lines. For the heavy weapon team, I wanted to go with more of a large mutant in part because it works well with the stat line, and I could use extra bits that normally wouldn’t allow a full weapons team (such as those pesky legs). 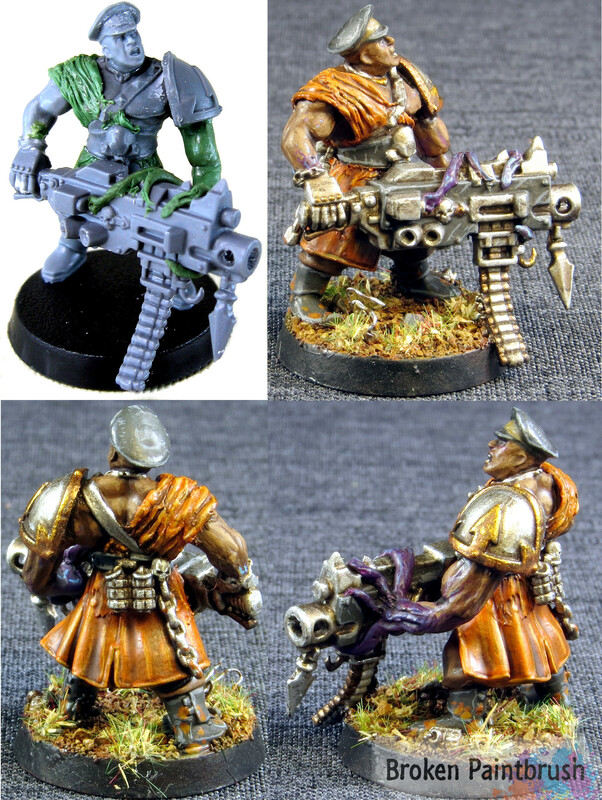 So a heavy bolter here, a snake-man there, and boom you have a heavy weapon mutant. And since one heavy bolter isn’t enough, I decided that to lead my squad I would include a count-as Sergeant Harker. So to bring the kit count up to 6, this heavy bolter is from the Chaos Space Marine box. I wanted to use the barrel chest from the Marauders but the great coat look from the Cadian commander, so a bit a greenstuff, and his fancy coat turns into a toga-esque robe. 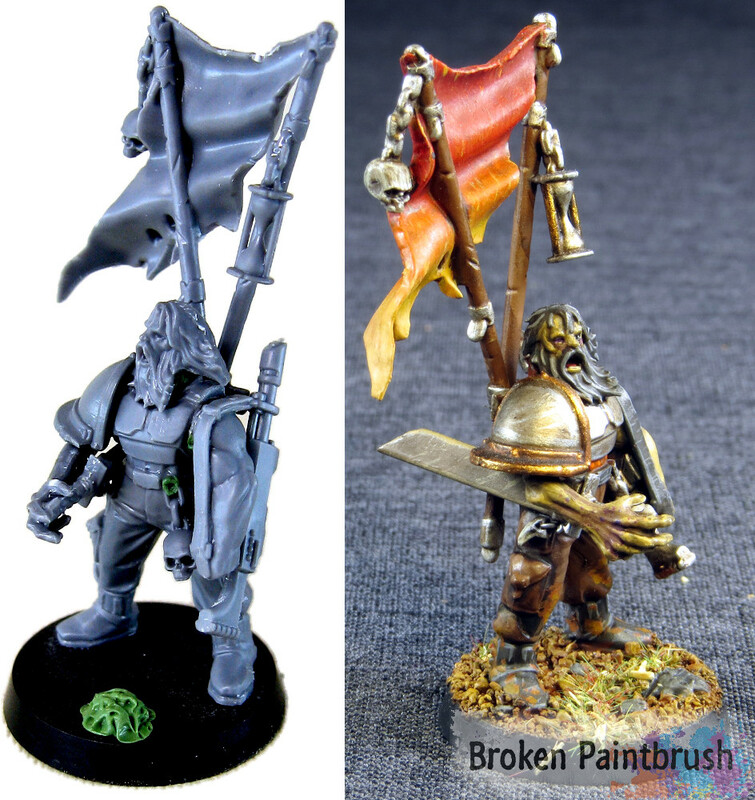 If you do any kind of conversions for traitor guard, or just creepy Imperial Agents, I highly recommend picking up a box of Flagellants [Amazon], for only $25 those bits go a crazy long way – and I haven’t even used the bodies for anything yet!